At the short end, the 1-month yield rose to 2.46%, near the top of its recent range, and near the upper end of the Fed’s target range for the federal funds rate (2.5%). At the long end, the 10-year yield dipped to 2.41%, lowest since Dec 29, 2017, below the 1-year yield and shorter maturities; but it remained above the sag in the middle, including the 2-year yield, which also dropped. At the far end, the 30-year yield dipped to 2.86%, the lowest since Jan 2018, but remained above all the rest. The sag in the middle began last November as a flat spot between the 2-year yield and the 7-year yield. On rate-hike day (December 19, black line), the 3-year yield (2.61%) was already below the 2-year yield (2.63%). In other words, the sag in the middle had formed, and the yield curve was “inverted” in that range, with the longer-term yield being higher than the shorter-term yield. Since then, the sag has gotten deeper. 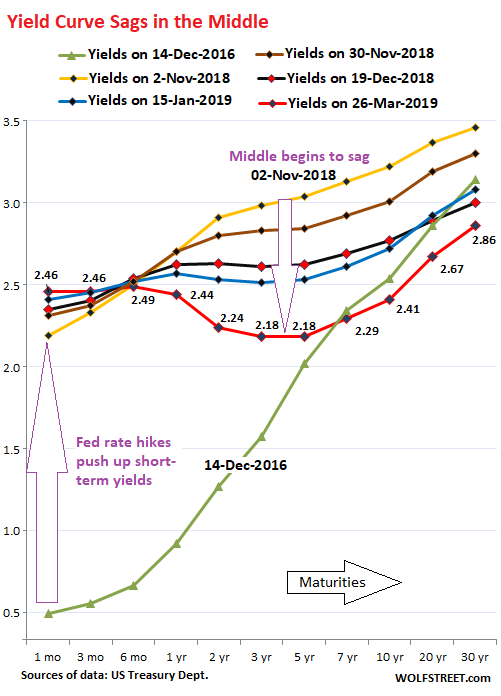 The yield curve for December 14, 2016, (green line) shows where yield had been when the Fed got serious about hiking its target range for the federal funds rate. The rate hikes pushed up short-term yields without breaking a sweat. Long-term yields however fell at first, with the 10-year yield hitting a historic low in July 2016. But eventually, the 10-year followed partially, but peaked in November last year, and has since meandering lower. Note how the one-month yield has been continuing its upward creep since the last rate hike in December. And the six-month has been stuck at around 2.5% since early November, which gives it the odd-looking position of a pivot of sorts on the above chart, with shorter yields on its left rising and longer yields on its right falling. 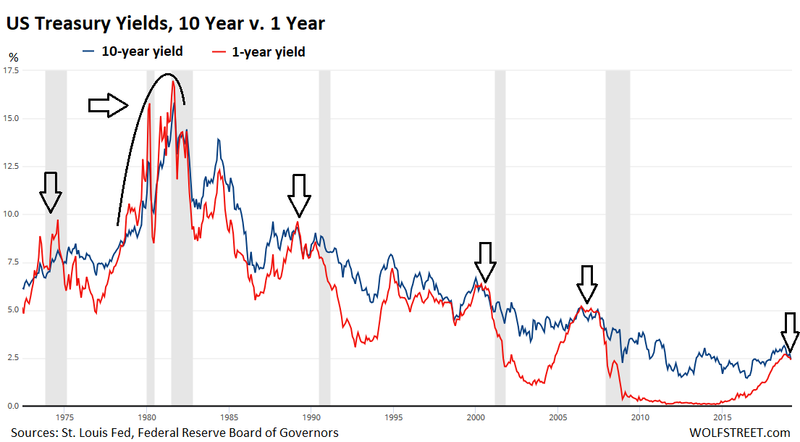 The yield curve today is inverted in this odd way, where the 10-year yield, at 2.41% is lower than the 1-year yield and shorter maturities, but is higher than the yields from two years through seven years, as denoted by the sag in the middle. The 3-month-10-year spread: Subtract the 3-month yield (2.46%) from the 10-year-yield (2.41%). If the result is negative, the yield curve is inverted. At the close on March 26, the difference is a negative 5 basis points, and thus the curve is inverted. The 1-year-10-year spread: At the close on March 26, the difference between the 1-year yield (2.44%) and the 10-year-yield (2.41%) is a negative 3 basis points, and thus the curve is inverted. The 2-year-10-year spread: The difference between the 2-year yield (2.24%) and the 10-year yield (2.41%) is a positive 17 basis points, about where it had been late last year. And by this measure, the yield curve is not inverted. Historically, the 2-year yield inverts well before the 3-month yield. But not this time. The fact that the 2-year-10-year is not inverted and that the curve looks nearly normal from the 3-year on up, while the 3-month-10-year and the 1-year-10-year are inverted makes this generation of yield curve inversion a weird specimen. The weirdness could be resolved by three rough days of trading that might rearrange all the yield-curve spaghetti in a different manner, inverte it across the board, or un-invert it altogether. Now everyone is trying to figure out what this weirdness means. In the US, the next recession – whenever it may eventually occur – will be the first recession when the Fed’s balance sheet is still swollen with assets, and when its policy rates are still low. And when this recession occurs, it would do so despite enormous federal government deficits that act as stimulus. With $1 trillion a year of this type of stimulus deficit-spending, which amounts to 5% of GDP, it’s hard for a recession to even occur – unless it’s triggered by a crisis of some sort. Part of the reason why the yield curve is sagging so beautifully in the middle and is not inverted from the 3-year yield on up may be due to all these unprecedented elements coming together, that may make the next recession, when it finally occurs, a different and surprising animal altogether. It seems that’s the message this sag in the middle is sending out. Well I bought a lot of Notes yesterday and it was shockingly low! The banks are being paid IOR more than my yield. UNFAIR! I guess Title 2 of the Financial Services Regulatory Relief Act of 2006 does not apply to Notes since it is not deemed as Short-Term! If the banks get paid 2.4%, then why shouldn’t we? The reason is only some T-bills are short term. ‘(12) EARNINGS ON BALANCES.—‘‘(A) IN GENERAL.—Balances maintained at a Federal Reserve bank by or on behalf of a depository institutionmay receive earnings to be paid by the Federal Reservebank at least once each calendar quarter, at a rate or rates not to exceed the general level of short-term interest rates. I do. I spread my eggs in 4 week, 8 week, 13 week, 26 week and 52 week besides notes. I just regularly invest on a schedule. Like clock work. However, investments in Notes are now questionable. Just dropped today to 2.41%. The distortion in the yield curve is building with tremendous force. There are vast bids for US 90-day T-Bills from around the world and no offers. The shortage in US government paper is now being reported from repo desks around the world. The US Treasury is selling bills / notes / bonds to fund the massive $1T per year deficit. But it is focusing mostly on bills, so the short end of the curve offers higher rates. As for me, I’m not unpleased. The short term bills aren’t offering what the CDs were offering a few months ago, but they are very competitive now. I think it is possible to game this, or at least get the short yields for more than a year. Buy Floating Rate Notes since their yield is based on the 13 week bill which is going good now. Shame on the FED for seriously muddying these waters. As that old commercial use to say “it’s not nice to try and fool mother nature”. It is all very distorted….”bass awkwards” if you will. IMO short terms rates are going to rise on their own accord, but I always prefer anything LIBOR based, as the Fed is a fraudulent entity. There are some short term securities that track LIBOR. Your readers need to know that today a huge bet was made that the Fed would not lower interest rates. It seems the market has priced in every Fed action except one, which is noteworthy because there is historical precedent for it. The Fed accommodated the market all through the 1920s, and indeed through the beginning of the crash. And then it refused to bail out the market and further. That’s when the huge crash began and the Depression began. People tend to forget that. And why did the Fed finally turn on the market? Because, if it had bailed out the market when it was really collapsing, it would simply have been along the lines of a fascist takeover. It would have announced a full corporatist economy. And the Fed refused to take part in a coup, for reasons explained below. The questions about this are: what does the Fed know about how bad this recession will get: how much unemployment, how much deflation, how much social deterioration, and so on. It has never been proven, but it is probably the case that the Great Crash Fed actually gamed a depression and determined that, although it would be bad, it would not be bad enough to overthrow the government. If it had been, there would not be a reason for NOT continuing to bail out the market, because there would be nothing to choose between one overthrow and another. Thus, I suspect the Fed has already gamed the upcoming recession and determined that it can stop bailing out the market, stop lowering interest rates, take the hit from a very serious recession, and come out of it with its power intact. In that case, there is no reason to continue bailing out the market. PPP, I’m very intrigued by your comment and hope you’ll respond to mine (a long one). I think you’re imputing too much to the Fed. They are getting better but are not as smart (or conspiratorial) as you characterize them. There is lots of evidence that they get things very wrong. Looking in the past, did they really know that a government overthrow would have been the result of their policies? It is only recently described by historians of that period that Hoover saw the downturn underway and wanted to initiate virtually every economic remedy that FDR eventually used. His GOP compatriots nixed it. FDR got full credit or discredit for them, instead. At the start of the GD, the banks and conservative thinkers felt that the financial system and economy needed to be “cleansed” – wash out the high level of speculation that they saw – “purify” and drive out the evil. It was an attempt to restore some kind of imagined economic morality. This “cleansing” was a greater cause of the depression and Fed policy than other things that were blamed for the Depression, like the Taft-Hartley tariffs which had relatively minor effects. Recall that the Fed didn’t see the LTCM collapse coming (engineered by two Nobel Prize winning mathematicians), the S & L meltdown due to deregulation of S & Ls, the dot-com insanity that Greenspan bought into and described as part of a “new economy”, the housing/crap mortgage bubble that Bernanke did not see… all leads me to believe that the Fed is NOT as smart nor as conspiratorial as many think. If you want to see chaos, look back at the frequent bank panics, commodity collapses, railroad speculation busts, crop failures, bank runs, et al in the late 1800s, before the Fed existed. That was a “free market”! The Fed cannot read tea leaves well enough to have a clear idea that the upcoming downturn or recession is “dire”, for example. IMO: They simply do not know enough about how the whole enchilada works. To think otherwise is 1) forgetting that they are human beings, and, 2) forgetting that economists get it wrong about half the time. When people are fearful, they see conspiracies when there are really just people trying to avoid hard landings and deflationary collapses of assets. Deflation is far more dangerous than inflation, imo. The Great Depression was DEflationary and went global. There were small countries that had only a few commodity exports that had dire, dire economic collapse but didn’t get much press. Inflation is frequently country-specific and, as Volcker demonstrated, more containable, and typically used to ditch large debts (Brazil, Mexico, Germany, Zimbabwe, et al). The 90-day/10-yr. yield-curve doesn’t yet suggest a major recession in the United States. Instead, it is a reflection of global uncertainty outside the USA. This Inverted Yield Curve is confirming that as the political chaos emerges around the world, the more foreign capital is parking in the dollar. With the May elections on the horizon in Europe, and the October elections in Canada, April elections in Israel, among others, the capital flows are still pointing ever stronger into the dollar right now. The foreign capital has been buying the 10-year notes driving the spread lower. LOL. Add that one to the glossary. Because we live in a totalitarian oligarchy ? That only benefits the rich, at the expense of everyone else ? There is a 30 year boom available to the U.S. by bring jobs home and rebuilding the USA. Exports are a small percentage of the GDP, and Imports represent sending US dollars offshore. “Free Trade” was always a political construct and never existed anywhere but a textbook. Currency exchange rates and different regulations in different countries make it impossible to have “free trade” where each country is on a level playing field. There is a 30 year boom available to me if I can keep raising my credit limit forever. Corporate America brought $US664.9 billion of offshore profits back to the US last year, falling short of the $US4 trillion President Donald Trump said would return as a result of the 2017 tax overhaul. Instead, companies have been plowing the tax cut cash into stock buybacks. Earlier this month, data from Citigroup showed that companies in the S&P 500 repurchased more than $US800 billion of shares last year, surpassing the amount they invested in new or upgraded equipment. That’s the first time that buybacks have been larger than capital expenditures, despite a change in the tax law that give companies immediate write-offs if the buy machinery. Capex was slightly more than $US700 billion, according to the Citigroup data. Dare I say more about your hope for better local jobs?! – Policies of your government. – Directions that major companies are taking. The Donald told a lie? I simply don’t believe it! “These unprecedented elements coming together, that may make the next recession when it finally occurs, a different and surprising animal altogether. This inverted yield cycle seems a little different than 07 and 00. Keep in mind that the 3m/10y inverted in late 1995. Also, the real economy does not seem to be flashing any stress indicators. Obviously the economy has slowed down compared to this time last year and it feels a little like Q1 2016 but that slowdown was very short lived. Household debt service ratios are at cycle lows. Overall credit delinquencies are not worrisome (excluding autos). There is no meaningful problems in the banking and shadowbanking sectors….yet. Of course that could change in a matter of months. Now give me my job at the Fed !! Was a pleasure reading your comment. Only at the end I understood what was all that Public Relations. PS: you forgot to upload your CV. Where can I see the breakdown of fed holdings? My hypothesis is the shape of the curve is entirely of fed’s making (raising short term rates, hoarding long term treasuries). Since it’s synthetic, not convinced the weird shape of yield curve predicts a recession. So Fed can easily tuck the ‘middle-age’ sag if it wants. What you’re describing is just a matter of what is maturing. The 5-year notes the Fed bought five years ago are now maturing and are allowed to roll off. The 10-year notes and 30-year bonds it bought 5-9 years ago are not maturing for a while and are staying on the balance sheet. According to the old plan, the Fed has been replacing maturing securities with securities of equal maturity. So a maturing 10-year got replaced with a 10-year. This system has gotten the Fed stuck with an average maturity of 8 years that keeps getting longer. Its new plan is trying to deal with this and shorten the average maturity. Rates are low compared to what normal? I posit that a normal has to be based on the amount of debt in the system. As the debt keeps building up, the interest rates *have to* keep trending down. Just look at the red line in the second chart. Like a tennis ball dropped on the floor, they keep bouncing up, but lower and lower each time. Soon enough the ball will remain on the floor. After that? Negative rates, or a financial system restructuring. Rates are low compared to the other times the US was approaching a recession. Therefore, the contribution to the Treasury’s TGA account might not be enough to pay the Interest to the banks. What a great democracy. This has to STOP. End the IOR and IOER now. sort of goes along the same line, though it looks like so far roughly only half of fed earnings (if that is what anyone calls them?) are being channelled back to IOR/IOER . Sure they could buy up more treasuries to improve that :-/ … or reduce rates :-/…. to set the equation positive…for a while :-/ ? The bond market is telling Jerome Powell right now that his next move is a rate cut. He’ll probably do it sooner than most think. The reality TV celebs, namely, Trump, Kudlow and Cramer will sit Jerome down and tell him to ignore the PHD’s in the building and just get ‘er done. The phrase “Don’t Just Do Something Stand There ” does not apply to our Central Banks. They need to give off the vibe that they have everything running smooothly. Maybe they have but i am not convinced. Neither Alan Greenspan nor Warren Buffett warned us in advance of the GFC. It would be rather comical to watch them reduce rates half a point, then see the economy and stock prices do nothing in response. Can you imagine the panic at that point? Watching central bankers build a house of toothpicks is quite comical. Best to panic early, folks. Base on the 10-year rate, it looks like the panic has started. we are heading for the final washout in inflation and asset prices, (so far declining dollar power means higher prices, but after you cross that threshold, and energy is the threshold, there is no stopping a deflationary crash, print more money and you simply devalue the existing cash even more. get your popcorn bowl and watch the show. yep, qe was the great inflation deflater, it was hoarded at the top and never cycled into the average family-persons like joe the plumber a home owner or Jane the legal secretary in condo at 34% take home to rent…. add in the run up of rental and health costs and bam, the flow of money from a lot of workers didn’t cycle anywhere except the credit funnel……while the rich hoarded and created reits out of foreclosures choking rental prices north…..
pottersvilles, rate inversion, the fed…..what a tv series…. PHDs have their place, but it is not wise to weigh that credential too heavily. Thinking and doing are separate wings and both are needed to fly/learn. I have worked with PHD modelers and economists for years and I would not trust many of them to babysit someone’s kids. Show me a PHD who has depended on the actual outcomes of their analysis and models for their livelihood and I will listen to them closely. Too often they only have a floating abstraction type of intelligence, coupled with an ego that blinds them to very basic aspects of reality. It is like building a beautiful (and expensive) car with a powerful engine, but no transmission. Very frustrating and costly to watch their models fail and then listen to them try to make excuses. THe FED has an army of PHDs and many examples of this. Look at their track record. A good modeler understands the limitations of the model. And I suspect most of the Fed PhDs have that understanding. Wolf, ah how can the banks lose in originating mortgages ??? I am still not sure why the inversion predicts a recession. Does it indicate an expectation of one by investors? Is it a causal factor or just correlated? From a classic textbook view, it is investor expectation that drives the inversion, e.g. BUT that does not mean for certain that is what is happening here, in part maybe because of novel fed monetary policy and balance sheet size. To me it looks more like a question of which wants to come down now, the short end or the long end. I dunno – guess it will also depend on how it looks the economy will be going ? The negative rates in Japan and Europe and their huge central bank balance sheets are a factor in my opinion. Its a global bond market and many foreign economies/populations are looking unsettled for the next few years. The banks know it. That is true also, plus there is the implied future strength of the dollar, and investments in dollar terms, that rate rises signalled, plus the resulting outflow of dollars from -or difficulty in obtaining dollars in – some other markets would make those markets seem less attractive. It is very hard, or impossible almost, to figure out how the world markets will behave though, apart from with quite a broad brush, and I don’t think US monetary policy is able to take more than a broad direction with regards as well. Exactly none of the old rules, fully apply or will start to fully apply, until the effects of Qe are out of the system. Then you still have the disrupting effects of other, outside, still ongoing, Qe programs, both overt a covert. So a partial inversion, does not necessarily mean what it once did. In the general time frame it once did. I think it’s because it shows a tightening in lending in the overall economy driven from a collapse in loan demand. Banks borrow short and lend long to make their spreads, making things difficult for them. Insurance companies, pension funds, etc also represent steady buyers of debt. This buying pressure overpowers the demand for new loans as businesses just aren’t seeing the need to expand. It’s not causation. It’s expectation. Expectation does correlate with the real economy. Bond investors, often more savvy it’s thought, are willing to take a lower rate in order to have that rate guaranteed for the longer duration. It’s a deeply pessimistic bet to give up 3% on 3 month bills to get 2.8% for 10 years. When the whole bond investing herd does this, apparently it’s a reasonably reliable indicator or so we are regularly told by the financial press. Thank you. You’ve explained this phenomenon perfectly. The smart money in the bond market is now seeing recession coming up over the horizon, and is positioning accordingly. The market making this deeply pessimistic bet, en masse, has been a powerful signal and remains so today. The Fed has done a nice job avoiding recession to date, but there is no inflation pressure and they need to cut the FFR now at least 0.25%, probably 0.5-0.75%, to keep this expansion going. If they don’t by the summer, that is my exit point for owning equities this cycle. No. If this were correct, the S&P 500 would be down 30% to 40% by now. Instead, it seems to me that this market is betting on a rate cut and QE WITHOUT a recession. Banks borrow short and lend long. When this isn’t appealing, they don’t lend. One reason of many: banks lend long and borrow short. Lending constricts with inversion, as the profitability shrinks with the inversion. Less lending is a contraction of liquidity which has already taken a hit over the last 12 months. My bank stocks are doing very poorly for this reason. Warren Buffet owns a lot of bank equity. Perhaps he sees something the market does not. It would be great to find out what that “something” is. Perhaps he’s anticipating the curve to normalize and bull steepen at some point, which will be great for bank lending. All government bonds or notes issued by any government (find or otherwise) acceptance by the ( buyers) on purely one Element ( TRUST). So the long term vis a vis short term debts that a treasury department issues will and always be judged by the amount of confidence you ( as an investor) show in the ability of the particular government to pay it’s Dues. If you get my drift?! the reason is the following. Bond prices are related to future expectations of inflation. the higher inflation means lower returns. therefore, the issuer will be paying higher nominal rates. If the traders are betting on a recession, they are betting that there will be lower inflation in the future. lower demand, and companies will have to lower prices to maintain market share. thus, as inflation expectations come down, the prices of longer traded maturities are going to go up because they become more valuable, therefore yields come down. Weird? Sure. Lots of weird stuff ever since the U.S. went full retard and followed Japan into zombie economics. No growth without debt and now even debt doesn’t get it done. CB’s thought they could eliminate the business cycle without consequences. Peak hubris. Inversion doesn’t mean much anymore other than the CB’s will have to get to work trying their best to engineer steepening. What for? Those needing access to credit won’t get it, those who don’t need access won’t care. The first chart is gorgeous! If you want a ‘picture perfect’ snapshot of the battle between the FED and the Treasury, your Treasury Yield Curve chart with FED rate hikes included, is it! There is obviously a major bank solvency problem once again and the Fed senses that the public will not tolerate a second bailout. This time, the very existence of the Fed is at stake. It doesn’t matter if the amount of the bailout is larger or smaller than last time, the public’s antipathy is much too great to watch the bankers and other profiteers prosper once again or even just walk away unscathed at taxpayer expense while more austerity is imposed on the public. Janet Yellin tells us that even QE combined with negative interest rates may not be sufficient this time. Thus, in addition, she says the Fed should be empowered to buy stocks. The banks and bankers are much too dominant and will never willingly accept an effective level of regulatory supervision. Any bank regulator who attempts to be effective will meet the same fate as Carmen Segarra who was terminated. Instead of once again saving the regulation resistant banks, bankers and shady operators, this time we should save the country and just nationalize the banks and let other insolvent corporations fail. Sometimes I wonder whether Fed/FRB endless appetite for asset inflation is driven by a desire NOT to be the one country that has cheaper assets than other countries? In other words, all the worlds central banks are in a game of who can inflate their own assets the most, so that nobody else can win the game by getting someone else’s assets for cheap (except the US, of course)? Their rich people versus our rich people, in other words. It is a real possibility that their rich people pauper our rich people when there is no limitation on capital flows. Is it conceivable that we can get all central banks in the world to engage in coordinated and synchronized asset deflation, or at least an asset price standstill, to put a stop to the madness of endless asset bubbles? “their rich people” are one and the same as “our rich people.” ain’t globalism great? My credit score went down this quarter because I didn’t have any revolving balance. I purposely paid off all my credit card balances early the last few months, just to see if I could raise the score. Laughing, instead of going up like I expected, my credit score went down. gives another reason ( updated methodology by agencies) . Maybe they just pencil in what they feel like though to see how many people complain… or there is a worker there who can’t reduce their debt so he (or she) just likes to punish people who do be messing with their score … you never know. Anytime your credit score drops significantly, you BETTER check. Don’t waste your time reading NerdWallet. Read your free credit report. If it drops just a little tiny bit, don’t worry about it. It always fluctuates. Nerdwallet was just randomly picked for giving an explanation to small changes that seem out. I understand some people take their credit score seriously, plus changes can mean some awry access to anyone’s accounts etc. might have taken place. I don’t have a credit score, have never taken on debt (except for one small private contract once to pay half the cost of some land by installment over a short period) , so it is just a small (and deserved I think) privilege to be able to make light of the theme . If someone tried to assign me a credit score I think I would tell them to f’off (literally) :-) . I think you do, if you’ve ever paid–or not paid–a utility bill. Disregard if you have no phone, electricity/gas, garbage, water, etc. bills and never had a driver’s license. I’m a permanent non-resident of nowhere, don’t live in the country of driving licence or nationality, my phone is prepaid without ID, I own a few non resident “strictly debit only minimal service” accounts, so if anyone wants to try to assign me a credit score for paying a few bills well lmao and it has no more incidence on my reality than if they were to scribble graffiti on their desk … unless they actually try to tell me to my face that that is what they have done, or that they work with those who do, and I will simply tell them that they are invading my privacy and to f’off. I don’t owe these people my time and I never ask for their attention either…but they tend to sense that anyway fortunately. I sold my residence and paid off a couple rental properties and my credit score went down because I “wasn’t a debt slave anymore” (paraphrasing). Hopefully you didn’t CLOSE any of those accounts? Yes! Great point … closing an account(s) would reduce available credit and result in a somewhat lower score. The available credit is actually a potential source of repayment in the short run … unless you run a government and then it becomes a perpetual source of repayment. Cesqy, Revolving balances are only a small part of a score. I suspect your FICO score exceeds 760, so you are already golden. So this is sorta like being ranked as a top 3 team, and falling 1 spot in the rankings because your last win was by a small margin. When you are near the top, it is easier to fall than to climb even higher. Nevertheless, if your score dropped more than 20 points, something else must have changed as well. Keep in mind that using scores to borrow/lend, i.e. use of imperfect models, is essentially mandated by regulations. Yes, average age of the credit accounts matters, to a lesser degree. I notice when Sam’s crossed over to a new CC, they closed a much older account. That started the average age of accounts over, thus slightly lowering the FICO score. Agreed, nothing to worry about when your score drops from 840 to 830. When it drops from 840 to 740 you better find out why. I got the same “Lack of revolving credit history” and similar drop in score. Always pay off credit card each month. And my credit is locked at all three credit agencies. My parents paid off their mortgage and their credit score droped pretty significantly over the next year or two. When they enquired about it they were told it was indeed because they weren’t servicing as much debt as before. The system needs some way to reward good willing debt slaves apparently – the ones that pile on lots of it, but also never miss a payment. and the system will limp along until it runs out of an increasing amount of willing debt slaves. currently there is no shortage. a commenter whose handle i forget right now referred to “the masses who see nothing but blue skies and unicorns grazing upon a hill” comes to mind. In every distorted fantasy economy, there’s a recession struggling to get out…..
Watch the 4-week moving average of the weekly unemployment claims for confirmation of potential emerging recession. At some point you have a credit crisis. That is banks won’t lend, and who really knows if good banks are willing to accept paper from shadow banks, who underwrite the overwhelmed consumer (I know lets repeal Obamacare, they won’t be saddled with those ugly monthly payments!) the real benefit is in the EM according to most analysts, but we are a third world nation, and a hot money destination, with a stock market busting out and a large homeless population. Could you clarify how federal government deficits stimulate the economy, in aggregate? My understanding is that when the federal government spends more money than it taxes, it runs a deficit. However, it also issues Treasury Bills, Notes and Bonds that match the deficit and withdraw money from investors. This would mean, in aggregate, cash is just redistributed within the economy and the public accumulates non-spendable assets (Treasury IOUs). That’s not how it works at all. Debt of any kind — private and public — stimulates the economy because it provides money to invest (building, etc.) or to buy goods and services with that get consumed, in return for an obligation. Both investment and consumption are added to GDP. But the debt (obligation to pay back) is NOT subtracted from GDP. That’s why there is so much emphasis on providing cheap debt to consumers and businesses — and to increase government deficit spending during recessions (fiscal stimulus). The prevailing low yields over the past decades show that there is enormous demand for this debt from investors and that there is no “crowding out” effect. But the problem with debt comes years or decades later, when the debt is still there, and the investment and consumed goods and services are gone, and at some point, it is no longer sustainable and something has to give. Then a lot of things get rolled back. But until then, debt of any kind stimulates the economy. Is crowdin out peoples who don’t want to do with debt. Mr. Government he buys an makes more expensive to buy same, Mr. Private he pays higher price cause he got debt an you got to compete with debt too or you not gain no access. Mr. Investor he always happy cause he get payin the interest, an even with no interest he watchin people payin more for his goods, he watchin his assets goin up cause people they competin for them. Then whata gonna happen? Then all is speculatin an renteer nation an they buyin everythin first an no room at the door for them that startin. Is big piece of shitness. Are you dictating this into voice-to-text software that is not working properly? This is too rough to sort through. “Debt, most especially where interest rates are centrally managed and not set by market or where the supply of money is tailored firstly to the completion of repayment, that actually being a disguised form of MMT, when fed into the economy and the hands of consumers, creates an upwards price competition with the result that debt, and then greater debt, is actually needed to even participate. The ultimate effect is for asset ownership to concentrate in the hands of those with highest access to this credit, be that generational or corporate financial or governmental, and for the high valuations to be maintained by increasingly lax supply of money. This crowds out, from start to end, participation in the market from the standpoint of a more neutral flow of funding, also known as living within means, also known as an economy that is structured on true activity with prices set to the unadjusted ability to pay. Investors will always be found for this because they profit from the increasing prices and the service cost paid them for their participation, even where there is no obvious profit as long as it somehow maintains the illusion of their position. The result is to reach a point where there is no natural access to the market for those starting out, prices being set to skim so much from others by forwarding the ability to pay, as guaranteed by government in the case of mortgages or the federal reserve by its macro prudence, that attempt at participation is limited to servicing the cost of this debt via rental of use and whatever rental of possible future own ability to finance that allows some kind of momentary reward . This creates a false economy where any achievement is measured by the ability of any participant to secure funding, then further funding, it creates a society that is directed by the arbitrary allocation of an endless flow of funds, an arbitration that becomes increasingly inbred and disconnected from the push and pull of real need within a visible, coherent and accountable setting. Those that would normally be understood as example, when seen to be greedy or selfish or manipulative, will no longer be given the respect needed to be able to dish out the hard love nescessary to set others straight, those bathed in self reward will not provide an example of success but of capitulation. A financial legislative cannot buy or replace the traditional stability of close transmission, only displace it, every opportunity having its unknown cost. Aggregate activity measured by monetary transaction is not going to provide a workable metric from which to judge the wellbeing of any society, and with the changes in that aggregate so managed that even those changes do not provide indication beyond the instability of the system of management. Therefore as a whole it is not correct to say that the problems occur later as the real value of an investment becomes apparent. The problem starts and occurs the moment anyone fields out their own possibilities and finds that they are rejected, that they have no place of opportunity, that they have no example to follow, within their familiar surroundings. That other possibilities with unknown result are made readily available is no recompense given the untested nature of the framework. Now I go back to my automatition scripting softwareness, is how I speakin cause that way they know. I don’t know, the whole yield curve inversion seems forced to me. Yes, there are inversions all over the place, yet the Fed has its fingers on every scale in regards to yields. The only yield curve inversion I want to take seriously is the 2 and 10, and that one’s narrow, and still positive. Also, I feel as though every market watchers is expecting a recession soon. I have no empirical proof, it just feels like 1994-1995 all over again, with doom and gloom, and then we got the “Greenspan Put” and everything just recovered, then boomed! Mind you, to me it has felt like 1994-95 for about four years now. Like you, I felt a “normal” recession was going to occur in 2016-2017, and I was surprised when it didn’t happen. Looking back at the historical graphs of the interest rates and central bank balances in Europe and Asia, I think I can see the massive overseas liquidity that was unleashed. Another economic effect in that same time frame was China’s “Belt and Roads”/credit stimulus. Now I don’t feel the central banks and China have the luxury to repeat. I think it’s down to Powell and his cronies decision, but they might be able to stretch it out until after the election. The Federal Reserve might be able to help the U.S. economy in a future downturn if it could buy stocks and corporate bonds, Fed Chair Janet Yellen said on Thursday. Speaking via video conference with bankers in Kansas City, Yellen said the issue was not a pressing one right now and pointed out the U.S. central bank is currently barred by law from buying corporate assets. “It could be useful to be able to intervene directly in assets where the prices have a more direct link to spending decisions,” she said, adding that buying equities and corporate bonds could have costs and benefits. Mmmmmmm…. Trickle-down economics and the wealth effect. I can just hear the bottom 90% of the public salivating at the prospect. This is whom hardscrabble-types like Yellen are targeting, right? If we allow the Fed to buy stocks, why not just pass a law that says stock prices must trade higher every month. Everybody would be a winner. The Fed could then engage in macro-prudential activities (whatever that means to them) to make sure there is no horse play. Or, the Fed could just print several trillion and give it to the top .1%. That would be a more direct route to Yellen’s apparent goal. Why doesn’t the Fed buy Food Stamps?…oh wait…that would be illegal. Think I’m beginning to see more clearly how it’s all suppose to work…. I’d accept the Fed printing several trillion and giving it to the top .1% + Wolf + timbers + Bobber + Tom + my mom. “No harm, no foul” is what I say. So, when should we expect our first installment…? Who cares what these people that now get paid to speak say? When the Fed was founded, it bought only corporate debt. Congress changed that in WW1 to require the Fed to buy Treasury debt to finance the war. Congress never went back to the original rules because they had found an unlimited source of funding thru this mechanism. So now, when we run into a recession and the Congress wants to stimulate, they have a ready source of funds from the Fed for additional spending without having to pull money out of the economy thru taxes. Ergo, 22 trillion in current debt and growing exponentially. 1) When the Fed raise rates twice in six month ==> fundamentals are bad. Powell tested the Fed power to induce inflation expectations. Wall street “experts” expected oil prices moving from $76 to $100, even $300. Gold started shining again, on the way from $1,300 to $1,500 and $5,000. On Oct 1st 2018 oil hit a long term resistance line coming from the 2008 high. Gold long term trend is still down. to the long term trading range. Expert expected the downdraft to cont to 65. 3) When the USD is rising and US treasuries % rates are falling, investing in UST5Y, or UST10Y a good trade. 4) Pigs can fly on linear charts, but not on log !!! been breached on linear charts, but not on the log, plenty of space separate price and the resistance line. The ability to pay interest is fixed. Therefore as the amount of debt goes up, interest rates have to fall to keep the amount of interest paid the same. This model works 100% of the time. Cash in the banks is growing. Rates are falling, the yield curve invert, but CL are rising. Many banks are paying quite a bit to get deposits. You just have to shop around. I see ads on this site for a 1-year CD offered at 2.85%, major bank, owned by a Japanese megabank. Lots of deals out there. 0% is only for sitting ducks. Is your key to the top chart mis-labled? There is one line is for “Yields on 30-Nov-2019” (which hasn’t happened yet) – should it be 30-Nov-2018? Also, should the key that says “15-Jan-2019” be “15-Jan-2019”? Thanks. Yes, the years for Nov and Jan got switched. So, what buyers are saying is that over the next 5 years, 2.18 percent will seem like a great deal? Otherwise, the better rate on a 3 month bond would be the better deal. Apparently people think that when that 3 month bond expires, by then the interest rates will be going down and they won’t get that good a deal again. To the point where getting that 2.18% for a 5 year bond today will seem like a really good deal. Sounds like the bet is being placed that the Fed will be forced back down to another reign of Zero interest rates. That this current time is just a brief blip of partial normalization before the free money flows again. Most folks who need yield are going somewhere else like EM debt or equity. These low Fed rates with low volatility does encourage risk taking. Too early to project rate cuts. When the FED has finished reducing its balance sheet later this year, these projections will have seemed ‘hasty’ indeed. My 30 year Treasuries that I bought in 1989 at 9.15% are now maturing. Any advice from the group on whether I should re-invest in 30 year treasuries at 2.8% is much appreciated. My crystal ball which guided me to buy treasuries at 9.15% back then, was broke when it fell off my shelf during the 1994 Northridge quake.